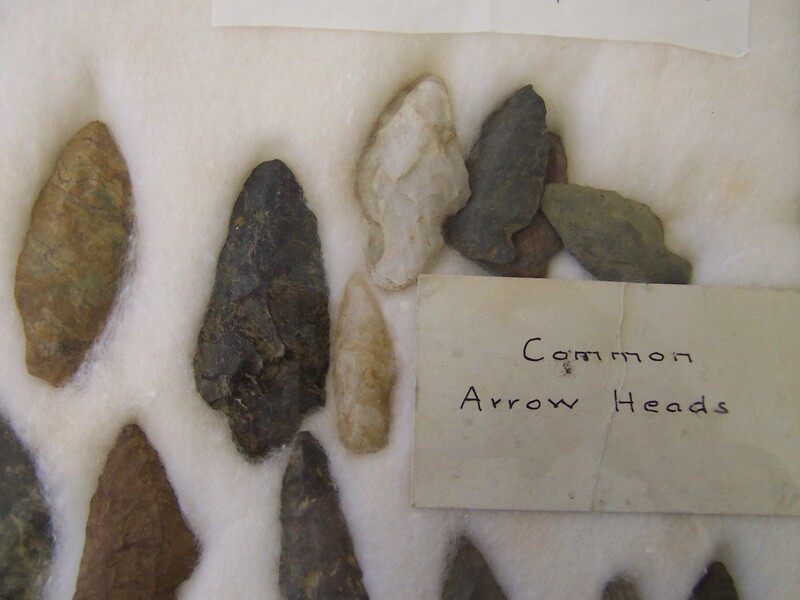 The exhibit tells the story of medicine in Sharon from 1738 when the town was founded in the unsettled part of colonial Connecticut to today’s Sharon Hospital in words, photos, and objects from the 18th century through today. Visitors can learn about the very first doctors and their methods. The stunning story of Sharon fighting its way through a small pox epidemic in 1784 using controversial small pox inoculations is told in documents and illustrations. An 1830’s doctor’s ledger of his daily calls and patient treatments is on display. Dr. William Coley, now recognized as the Father of Cancer Immunotherapy, was a Sharon resident. His life’s work was preserved by his daughter Helen Nauts of Sharon, founder of the Cancer Research Institute. Their compelling story is revealed in the exhibit. Contents of the 1900 medical bag of Sharon Hospital’s founder, Dr. Jerome Chaffee, are on display along with common quack medicines that people were using and doctors were fighting against. Dr. Josephine Evarts became the first woman doctor at the hospital in the 1930s and was a medical force to be reckoned with throughout the Northwest Corner until her death in 1983. Tributes and anecdotes from her patients and their families are shared in the exhibit. Visitors will also learn about the founders of the Sharon Clinic in 1947, including Dr. Robert Noble who was also part of the 1956 Nobel Prize-winning team of Drs. Cournand and Richards, and the impact that all the Clinic doctors had on their patients for decades. Today, the medical industry is the largest employer in Sharon, but the story of its evolution has never been told before in one place. 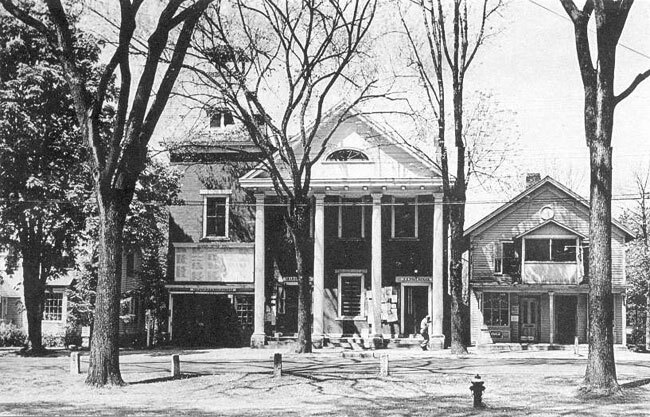 Sharon Playhouse has a storied history, dating back to a small group of theater lovers in the 1930’s who would meet to informally to act out plays. This exhibit looks at the different incarnations of the Playhouse over the years and the spectacular shows that have riveted Sharon residents. On display are costumes, playbills, posters and other memorabilia. The civic, educational and cultural contributions of the Club have been manifold. Shortly after the Club’s formation, the first community project – sewing classes in the school – answered a need for that time and we have continued to respond to each new need over the years. 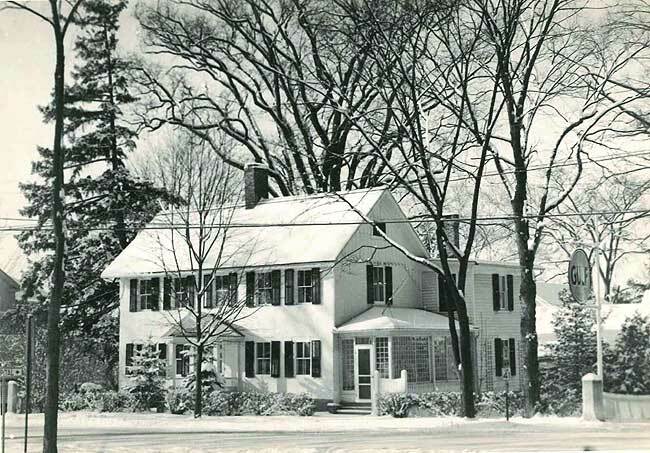 The Sharon Historical Society is open Wednesday, Thursday, and Friday, 12-4 and Saturday 10-2. 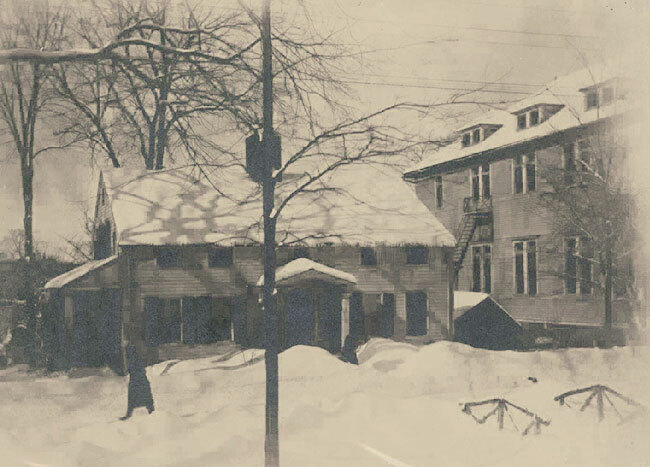 Unknown to many locals, Russian Jewish immigrants began purchasing farmland in the Ellsworth hills above Sharon in 1907. The new immigrants had been forbidden to own land in Russia, and they were working in sweatshops and living in crowded tenements on the Lower East Side when Baron de Hirsch’s Jewish Agricultural and Immigrant Aid Society offered assistance with farm mortgages. The Jews saw land ownership as their chance for genuine freedom, and dairy farming as an opportunity to counter prejudice by showing their capacity for hard work. Over 30 immigrant families would become dairy farmers in the Ellsworth hills. Among these are families whose descendants still have farms in the area, including Osofskys, Paleys, and Gorkofskys. Since the land was stony and unyielding, most took in vacationers, offering rooms with kosher meals to make ends meet. 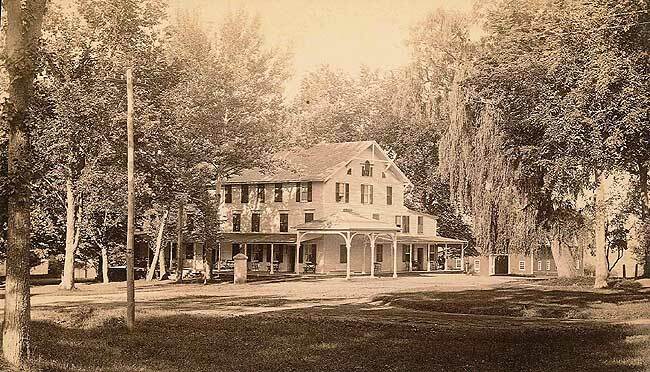 By 1925, the families began to run boarding houses and hotels in nearby Amenia, New York. Directly on the train line, Amenia became an early Jewish resort for New Yorkers seeking a reprieve from city life amidst country views and fresh air. 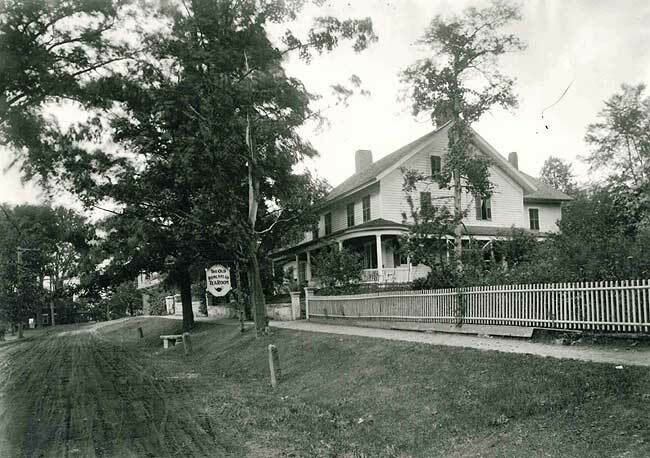 An exhibit, A Chance for Land and Fresh Air: Jewish Immigrant Farmers, Hoteliers, and Shopkeepers in Sharon and Amenia, 1907-1940 opened at the Sharon Historical Society on October 22. 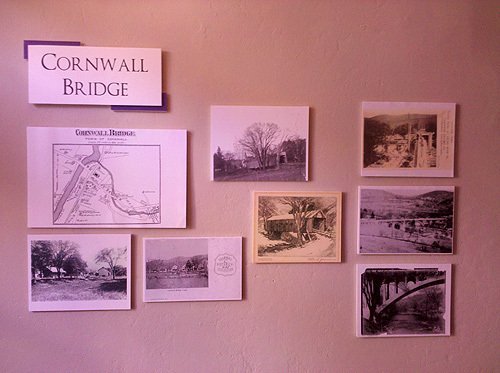 The exhibit celebrates this unique two-village story through photos, news clippings, and other historical documents, as well as period farm equipment and audio interviews with early settlers and their descendants. 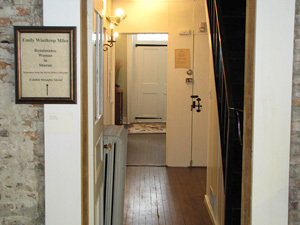 The Sharon Historical Society is open Wednesday-Friday, 12-4 and Saturday 1-5. Emily Lindall Winthrop was born in New York City to Grenville Lindall Winthrop and Mary Talmadge Trevor Winthrop on March 10, 1893. 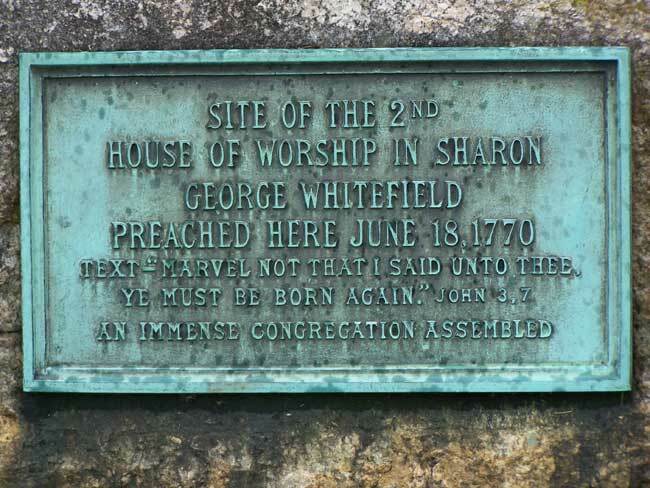 Grenville Winthrop was a tenth generation direct descendant of Governor John Winthrop founder of the Massachusetts Bay Colony and a ninth generation descendant of John Winthrop The Younger who brought iron production to the Massachusetts Bay and Connecticut colonies and served as the Connecticut Colonial Governor for eighteen years. Emily Winthrop grew up in New York and at the family estate, Groton Place, in Lenox, Massachusetts. 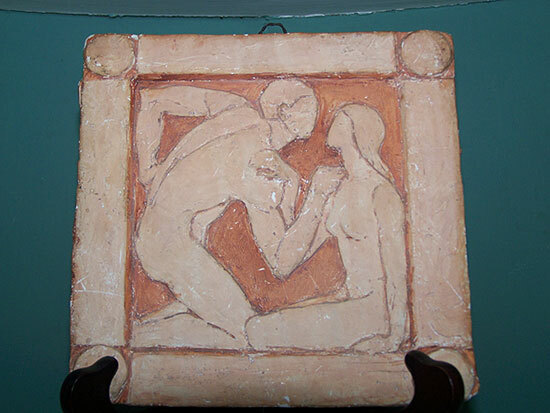 She was educated in the arts and became a superb artist as a sculptor, painter and portraitist. 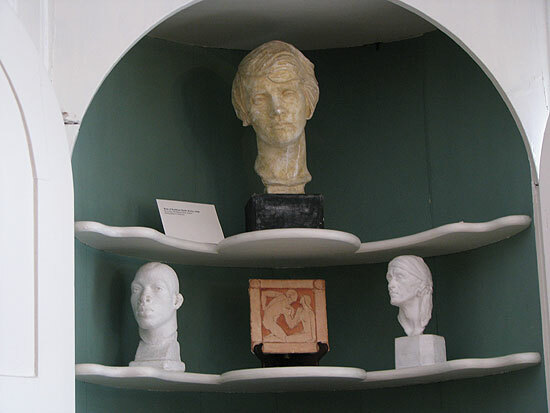 She studied sculpting under famous sculptor Daniel Chester French and also with Abastenia St. Leger Elberle, Brenda Putnam and Harriet W. Frishmuth. In September 1924, Emily Winthrop eloped with the estate chauffeur Corey Lucian Miles (1891-1960), along with sister Kate who eloped with Darwin Morse, (formerly the Groton Place poulterer). 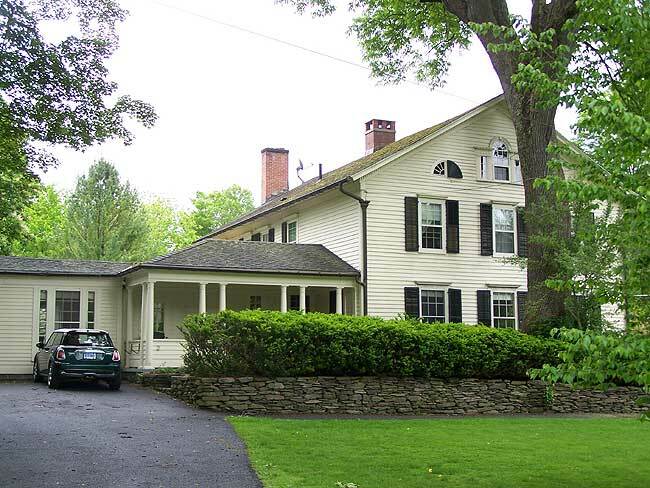 The four were married in the Interlaken section of Stockbridge Massachusetts. Over the next two years the foursome resided in Santa Barbara, California. On the return to the East Emily and Corey searched for property, finally settling on Neverland, along the Sharon/West Cornwall Road. 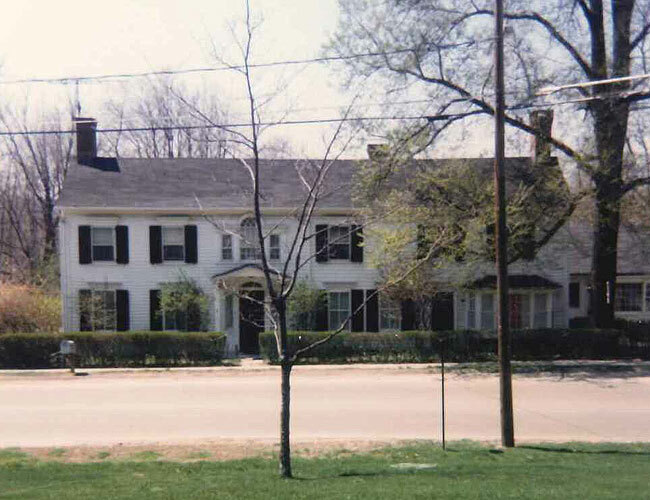 The central property was purchased in 1925 from the Stickles family, formerly owned by collier and mill operators Moses Handlin, and later by Dwight Handlin. When the Miles were in need of assistance to develop their farm and estate, they called on good friend Edward J. (E.J.) Kirby (1898-1945) from Lenox, who operated the estate and farm for the rest of his life. Corey Miles took over the North Canaan Airport in 1929 and ran it successfully until 1947. In 1930 he and barnstormer Roscoe Britton flew Mrs. Miles and Kathleen Kirby (1898-1994, E. J. Kirby’s wife) from Canaan to East Boston Field (now Logan Airport) and back, the first flight of its kind from northwestern Connecticut. Mrs. Miles was frequently impressed with the face or bearing of individuals and she would use them as models for her statuary. THE CARPENTER was a worker from West Cornwall, and THE ATHLETE was modelled from middleweight boxer Tiger Flowers Johnson. Her several large scale sculptures received wide acclaim, including the 7.5 foot tall aluminum casting of a dancer (Diana) which was exhibited in the American Pavilion at the 1939-1940 New York World’s Fair. 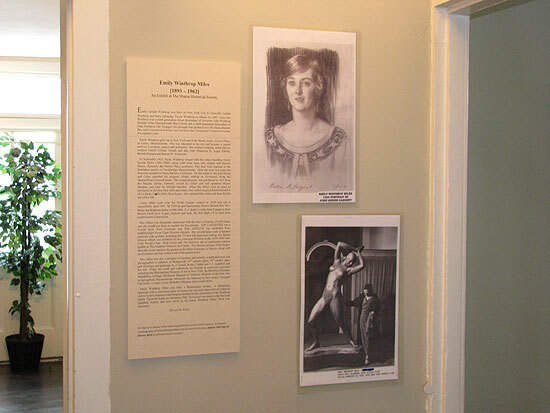 Both Diana and The Huntress are on permanent outdoor exhibit at The Southern Vermont Art Center. Two bronze castings of her larger-than-life works stand in the garden at the Miles Sanctuary in Sharon, along with an aluminum cast bas–relief north of the garden pool. Mrs. 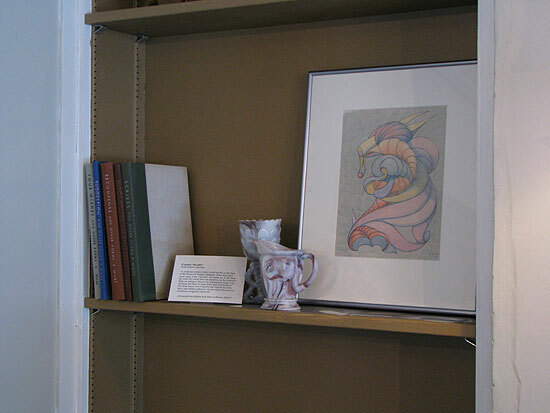 Miles was also a designer of furniture and jewelry, a published poet and photographer, a collector of Wedgwood, 19th century glass, 18th century glass and drawings and paintings by J. Gould, Rodin, Calder and J. J. Audubon and his son. 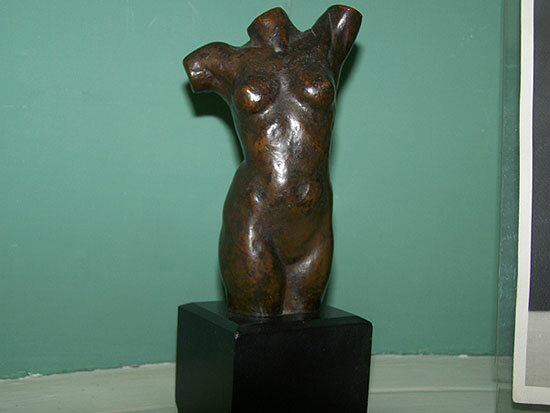 Today her work and collections are housed in numerous museums including the Metropolitan Museum of Art in New York, the Brooklyn Museum, Middlebury College, Shelburne Museum in Vermont, Museum of the Fine Arts in Springfield, Massachusetts, Montclair Art Museum in New Jersey, Syracuse University, Cooper Union, Berkshire Museum and several others. Emily Winthrop Miles was truly a Renaissance woman. A fascinating character with a marvelous sense of humor she was more than a bit of a rebel as shown by her elopement and frequent disdain for the formalities of the Winthrop family. Upon her death on Christmas 1962, Neverland was ceded to the National Audubon Society and now serves as the Emily Winthrop Miles’ Wild Life Sanctuary. Emily had wide-ranging collecting interests and often took young Ed Kirby with her to browse antique shops looking for a wonderful “find.” Slag glass, Staffordshire animals (particularly the poultry! 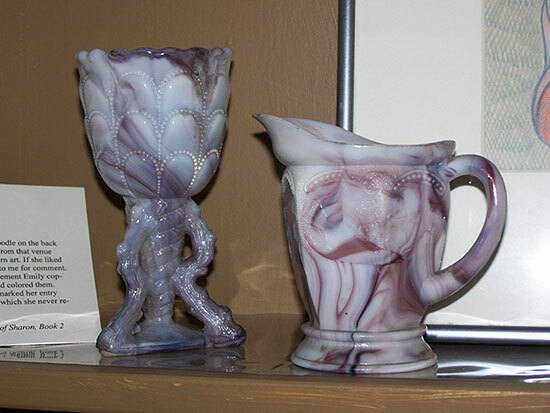 ), hobnail glass, Wedgewood basalt china, and minerals were some of her favorites. Upon her death on Christmas morning, 1962, her collection of eighteenth century glass and ceramics-over 948 pieces-was bequeathed to the Brooklyn Museum. Mrs. Miles was frequently impressed with the face or bearing of individuals and she would use them as models for her statuary. THE CARPENTER was a worker from West Cornwall, and THE ATHLETE was modelled from middleweight boxer Tiger Flowers Johnson. E.J. Kirby was a boxing fan. … Emily was also a boxing fan to a point. E.J. arranged for a boxer names Tiger Flowers Johnstone to pose for her. 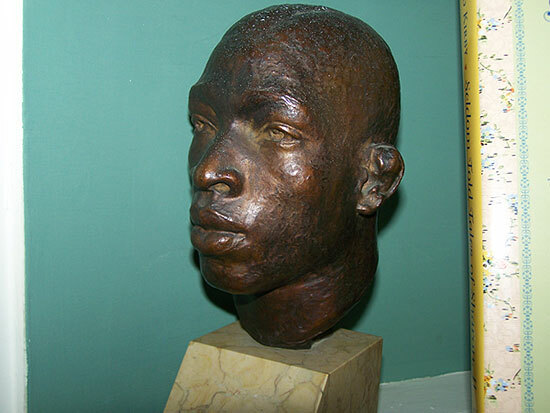 A rather handsome man, the resultant statues, a bust and “The Spearthrower,” even contained such details as Johnstone’s cauliflower left ear, a common malaise of boxers. Today we think of the Sharon Green as primarily a residential area. 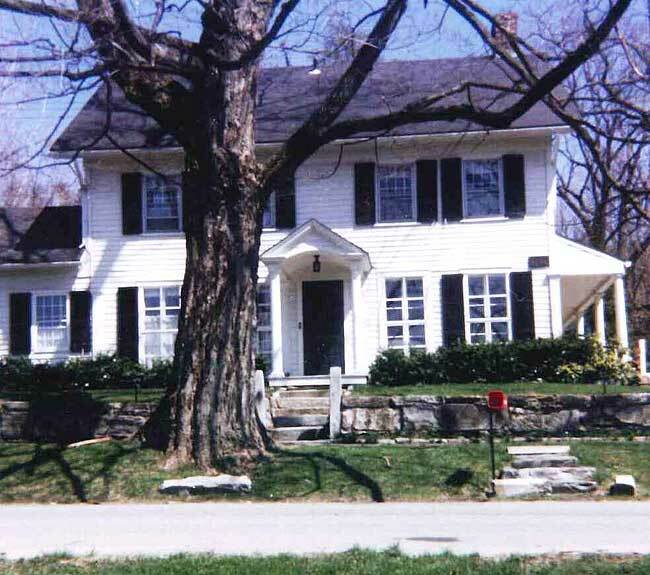 It is a beautiful, open space lined with rows of large trees and surrounded by well-kept, historic homes. But it has not always been that way. 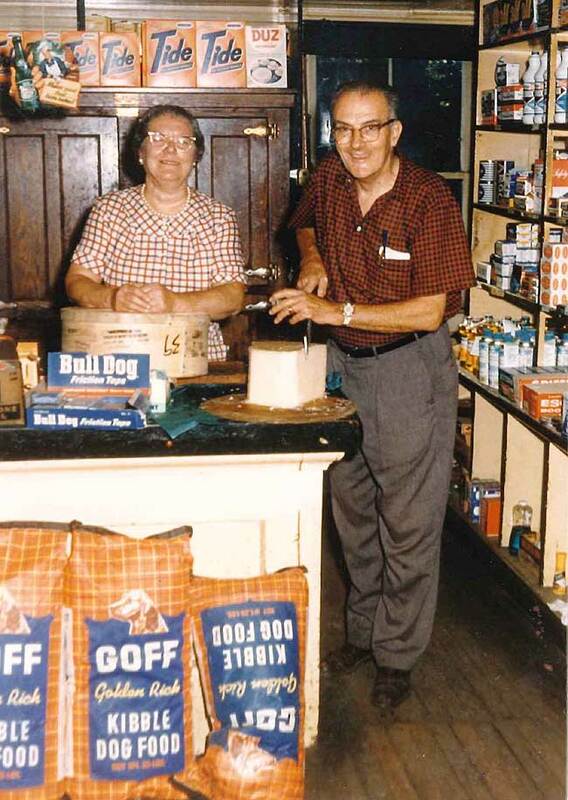 For most of its history, the Sharon Green was the center of commerce for the Town of Sharon and the near-by farms and industries. 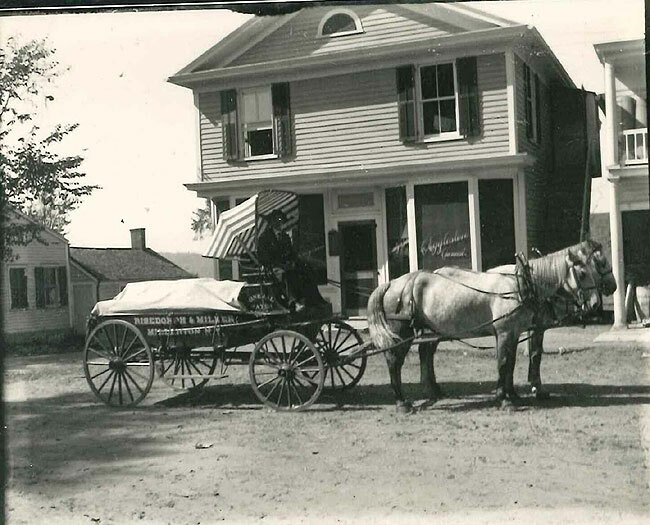 In the days before automobile ownership became widespread across America, most small towns, including Sharon, hosted a wide variety of businesses that offered the many goods and services that were needed by the local residents. In Sharon, almost all of these businesses were located on Main Street and Upper Main Street facing the Green. 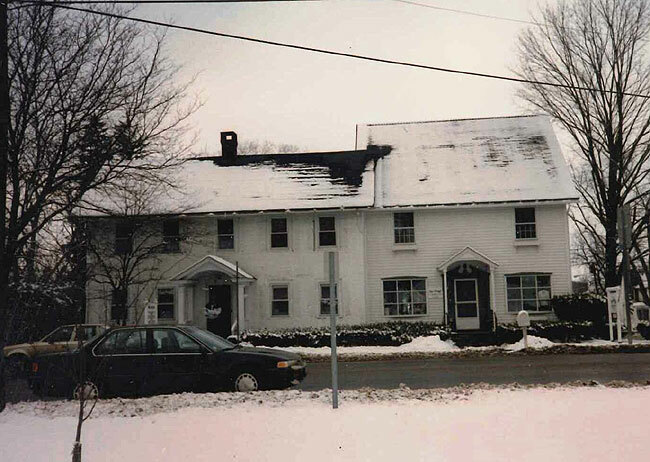 A few were located on West Main Street or in Sharon Valley, but many were in buildings facing the Green – buildings that remain standing today. The photographs in this exhibit illustrate how the uses of twelve buildings facing the Green have evolved over time. 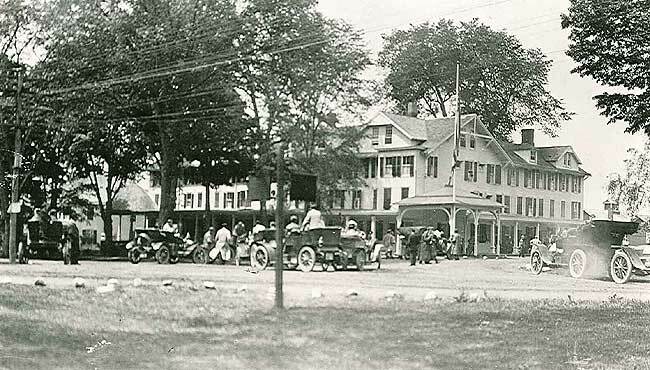 As automobile ownership became widespread in the 1920s, and prevalent after World War II, most of the businesses facing the Green closed as people began to drive to neighboring towns that offered larger stores. This trend was accelerated in Sharon by the opening of the Sharon shopping center in 1960. Although the closing of small stores and the establishment of shopping centers is often thought of as an unwelcome development, those trends have been critical in making the Green the quiet, beautiful place that we know today. If the Green were still a center of commerce, it would likely be surrounded by parked cars; part of it may have even been paved over for parking. 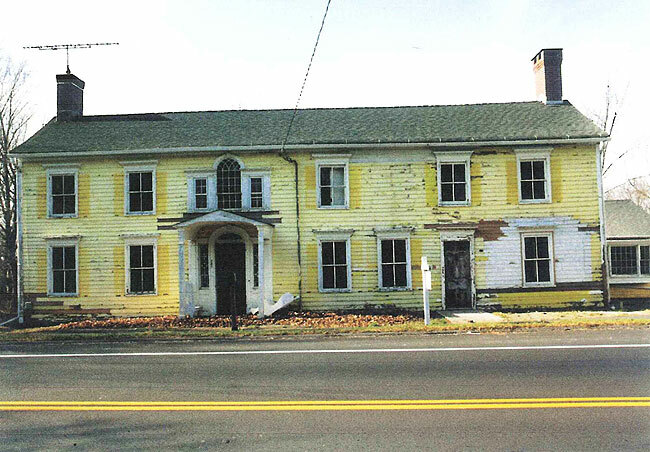 Also, it is likely that many of the homes would have been modified to have larger storefronts, as has happened on the main streets of many neighboring towns. The Green would be a far different place than what it is today. The Green was the home of several inns in the 19th century. 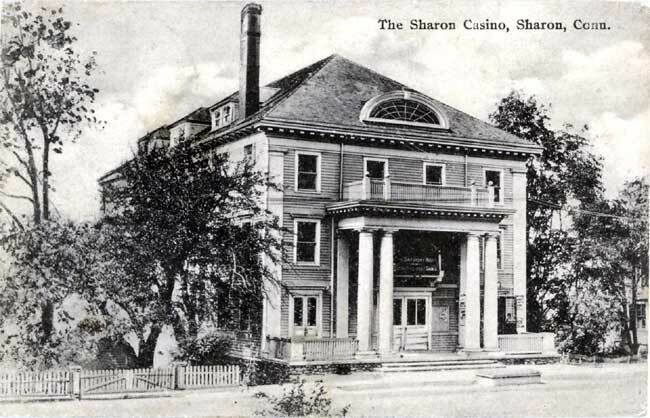 The largest and most important of these was the Sharon Inn, which was located just across South Main Street from the clock tower. 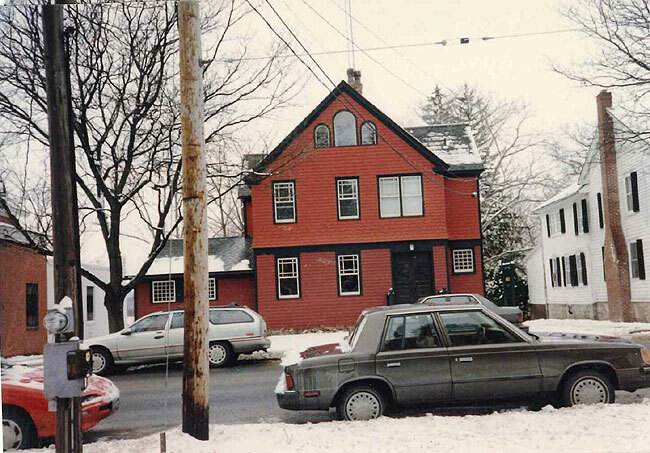 The original building was expanded several times with additions both to the front and rear. 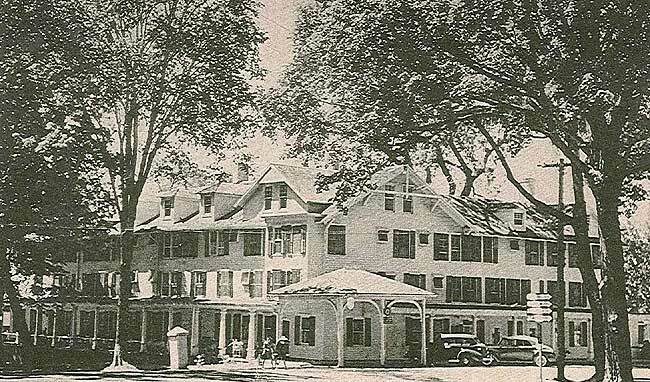 The Inn was razed in 1954, and the site is currently the home of the memorial to the men and women from Sharon who served in the military. 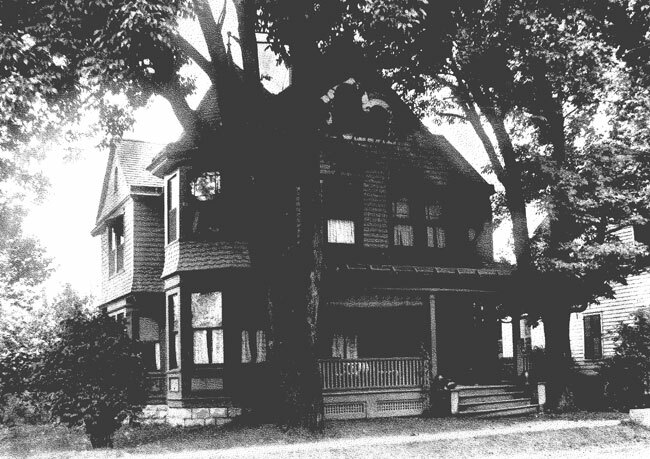 Photographs: Later views showing additions on the west side. The view to the south from the front yard of the Inn. 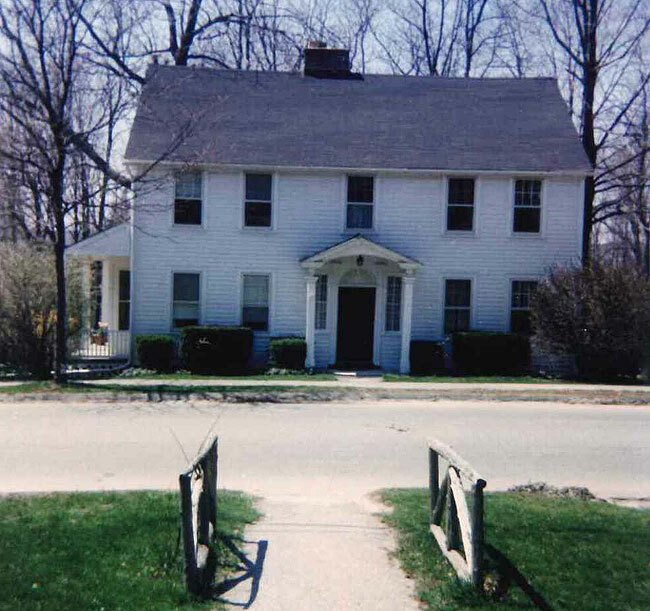 This house at 2 Main Street, which is now exclusively a private residence, sits diagonally across Main Street from the site of the Sharon Inn. In the 18th and 19th centuries, this key location, at a busy crossroads, was the home to a general store, a millinery store, a jewelry store and a lumber yard. The leftward curving tree seen in photo number one still stands today. 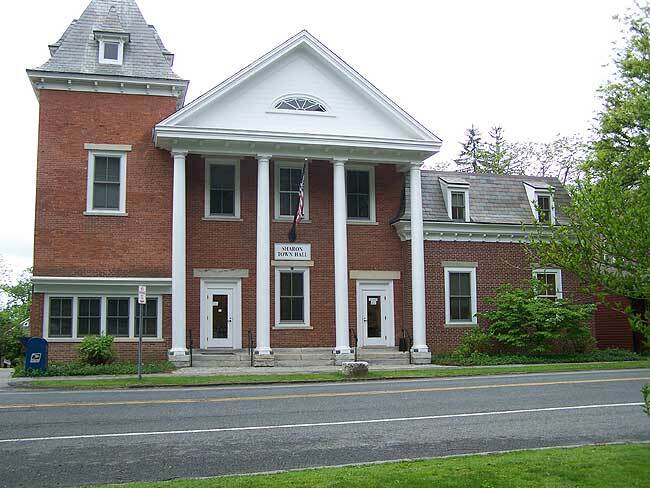 Town Hall has been the center of Sharon’s civic affairs since it was built in 1875. It was also a hub of commerce for many years. 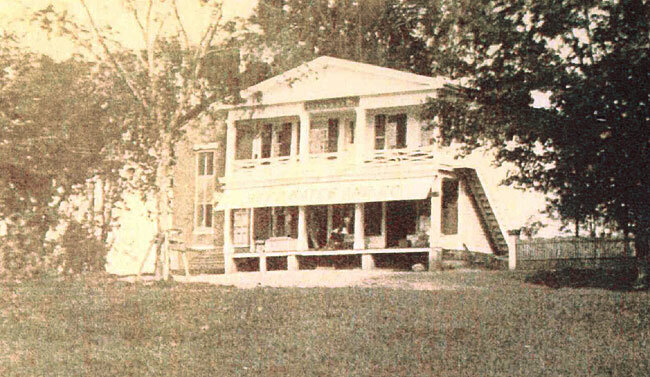 The building was initially much smaller than it is today and had no columns. It was also the home of the post office. 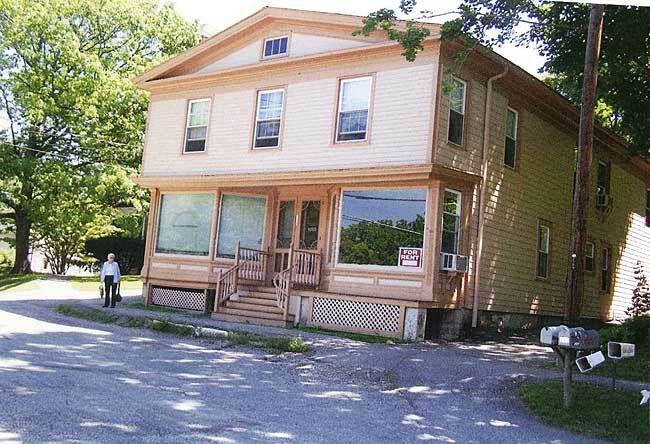 There was a house immediately to the right of Town Hall that housed a pharmacy and various other businesses. That building was razed in the 1950s and replaced by a new wing of the Town Hall building, which housed the post office. The post office addition was removed and replaced by a new wing of Town Hall in the early 1990s. Note that the fire department was housed in the wing of Town Hall under the tower at one time. The post office addition was removed and replaced by a new wing of Town Hall in the early 1990s. 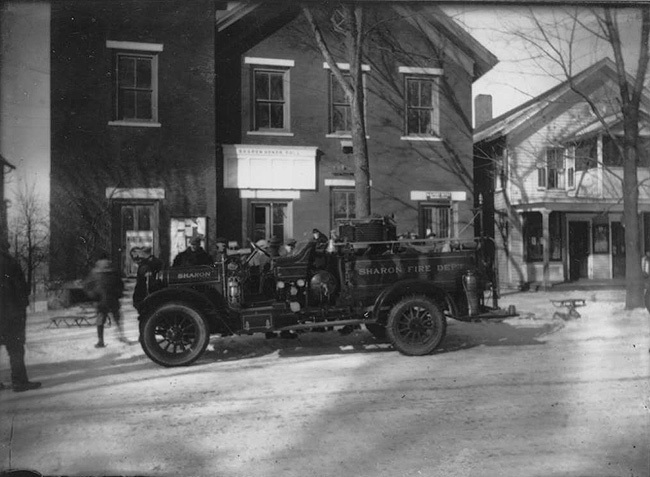 Note that the fire department was housed in the wing of Town Hall under the tower at one time. This stretch of Main Street is home to three buildings with significant commercial histories. 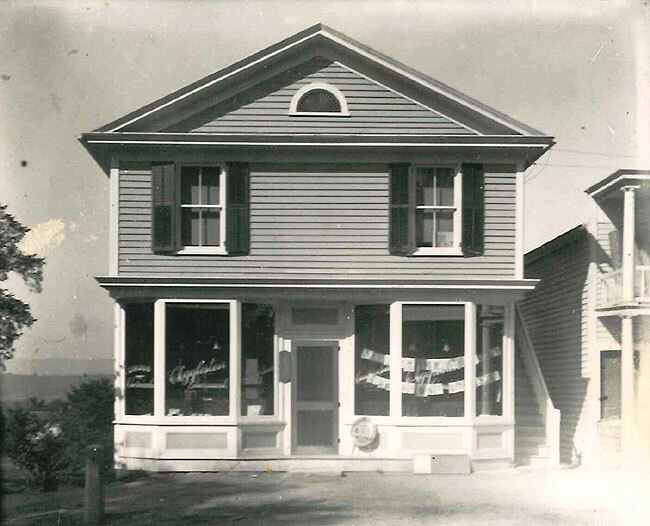 The Marckres House at 67 Main Street, built in 1890, has been the home of a clock and jewelry shop, a barber shop, a photography store, The Singing Hollow Shop (a variety store), WKZE and WHDD. The original house was rich in architectural detail, most of which was removed when aluminum siding was added sometime after World War II. Much of the original detail was restored when the building was restored in the 1980s. 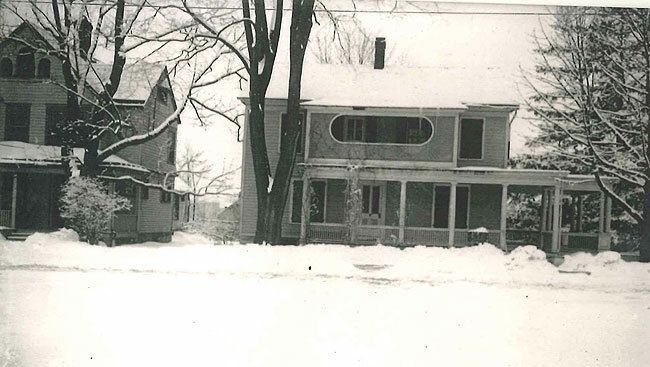 The Charles Sears House at 73 Main Street, built in 1840, was the home of the Sears Harness and Trunk Manufactory. There was also a tannery in the rear. The building also housed the offices of Dr. Sears and Dr. Gudernatch. 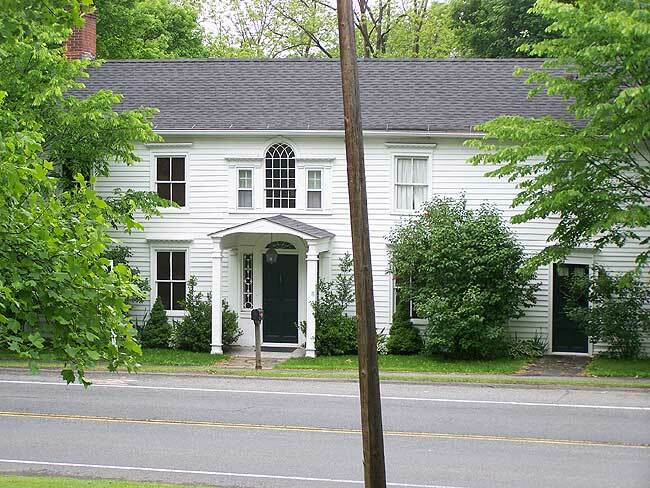 The brick part of the Russel Bartlet House at 81 Main Street was built in 1783. 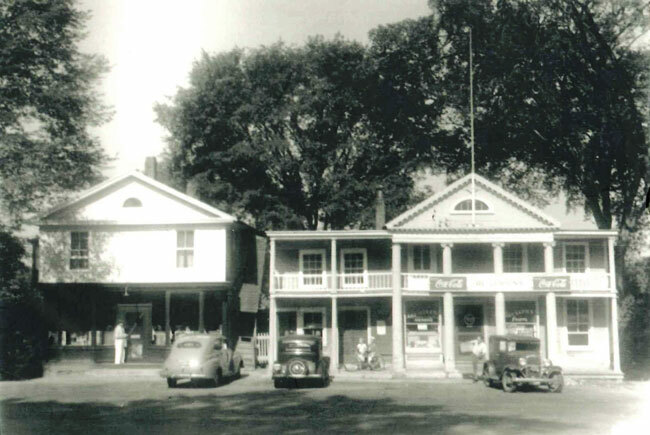 The wooden portion extending to the corner with West Main Street was added in 1959. This building housed various businesses owned by Edward Middlebrook in the early 1900s, including a meat market in the rear. It was also the home of the post office at one time. More recently it has housed a fabric shop, a beauty salon, a clothing store and a bookstore. 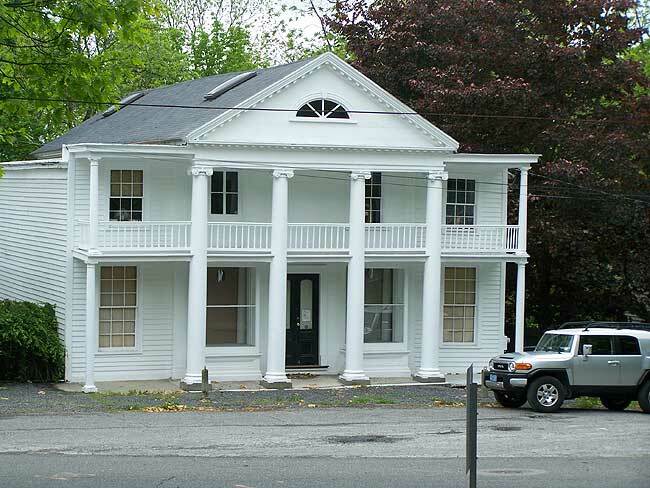 The Abner Burnham House at 125 Main Street was built in 1811. 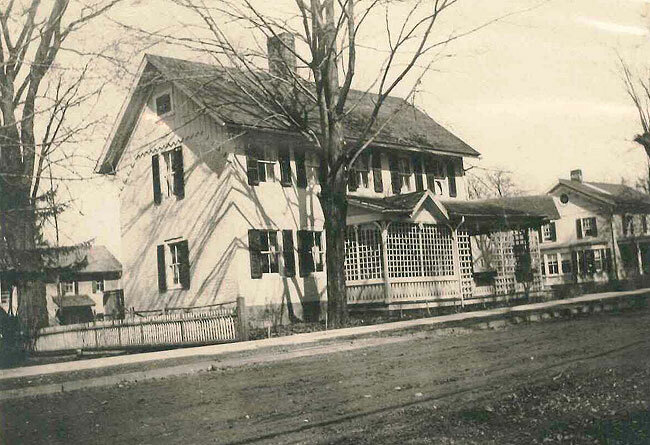 It housed Sharon’s first clockmaker and also served as a tavern beginning in 1838. It also housed a dame school, which was a school for young children. It housed a millinery shop by 1865, with 6-8 employees. 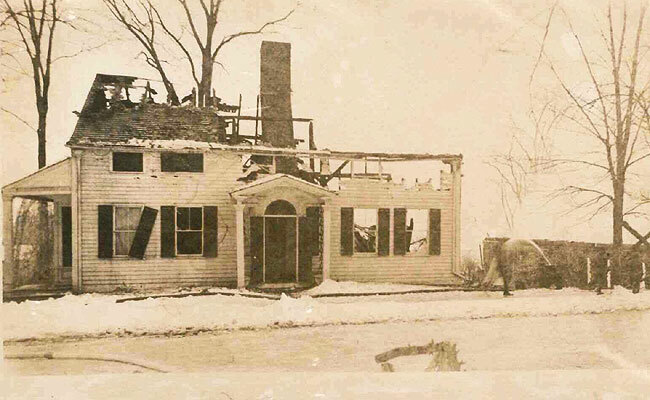 The house was severely damaged by fire in 1925, when the Casino, which was located immediately north of the house, burned to the ground. 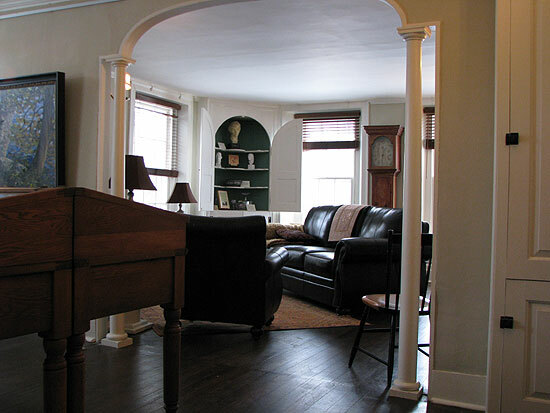 When the house was rebuilt, the roof was raised to provide for a full-height second floor. 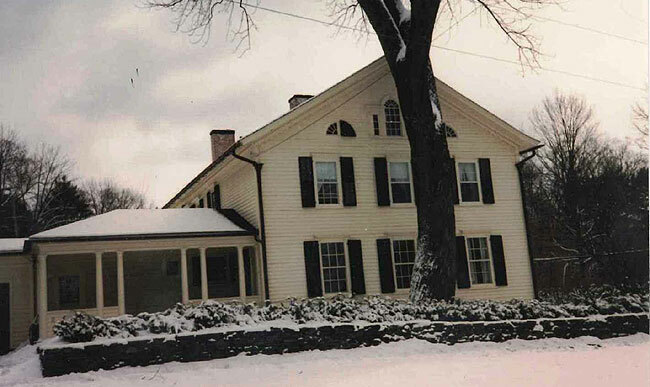 The Prindle House at 141 Main Street was built in 1810. 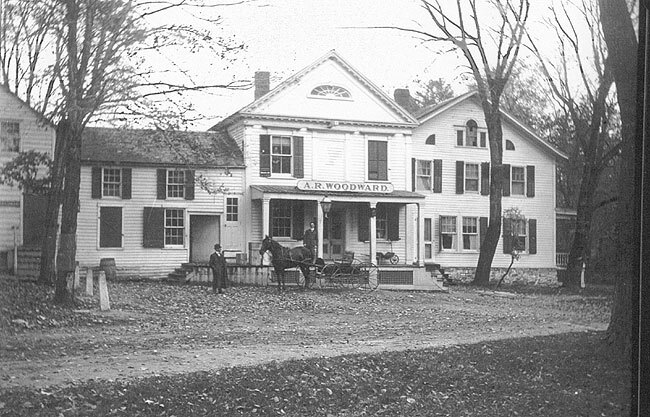 Although currently used as a residence, it has housed many businesses over the span of two centuries, including a millinery shop, a dress shop, a clock, watch and jewelry store, a shoe store, a grocery store, a drugstore, and icecream and soda shop and a print shop for The Rural Gazette. 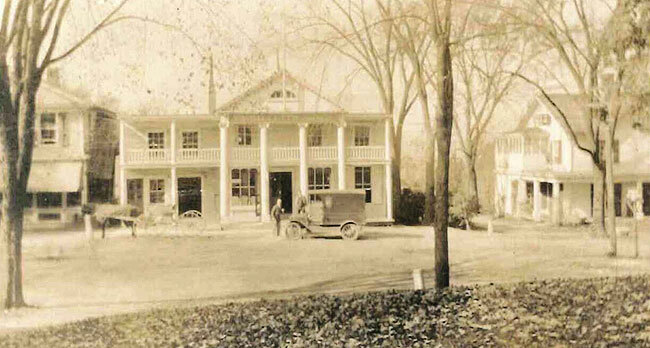 Like many other buildings on the Green, it also housed Sharon’s post office at one time. 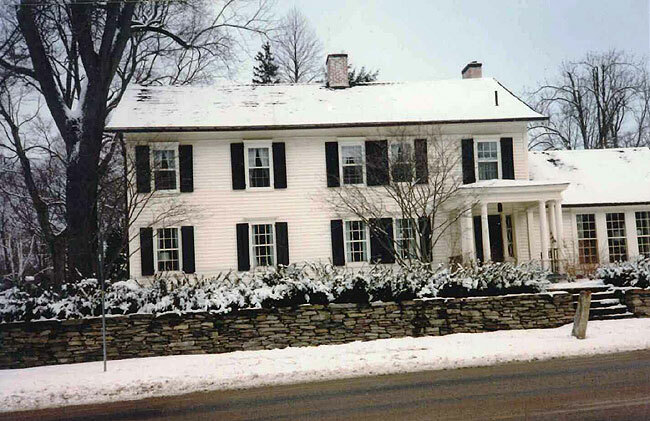 Most recently, it housed the Connecticut Yankee and Marge Anderson’s Country Clothes. 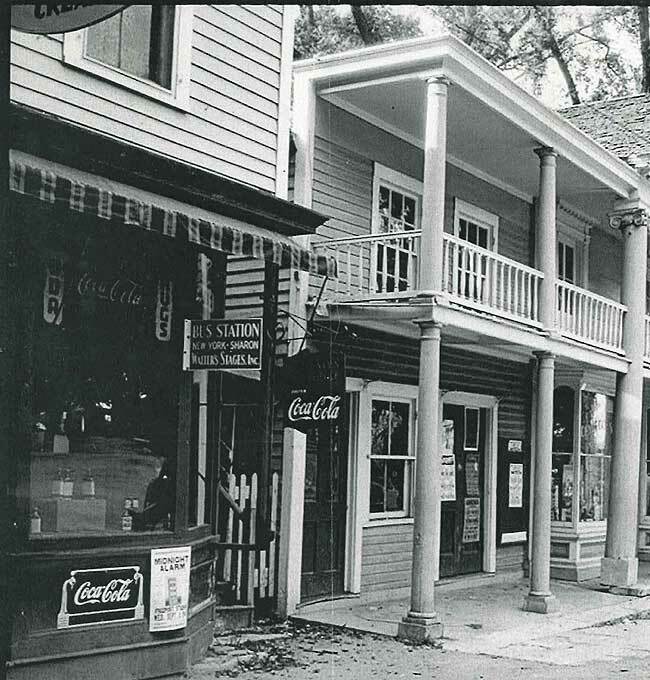 Most businesses were located on the lower part of Main Street, but a few were located on Upper Main Street, especially on the northern end of the street. 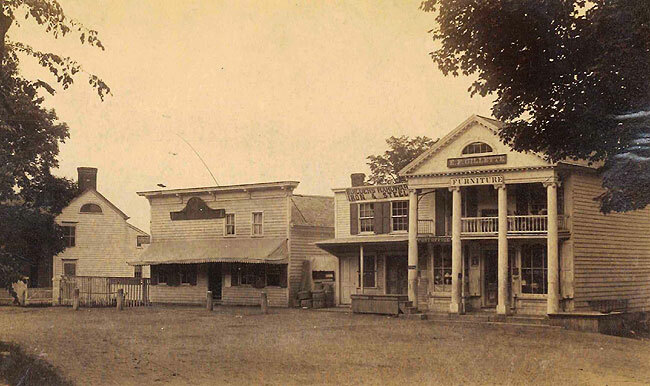 The Wike Mercantile building at 106 Upper Main Street, built in 1855, has housed many businesses in its two storefronts, including the local office of the Connecticut Power Company, the bus station, the telegraph office, a barber shop, a beauty parlor, a coffee shop, a fish market, a laundry, an office of the Sharon National Bank (later acquired by Union Savings Bank), Olsen’s hardware store and a Radio Shack. One of the storefronts also served as Wendell Wilkie’s campaign office during the 1944 Presidential election. 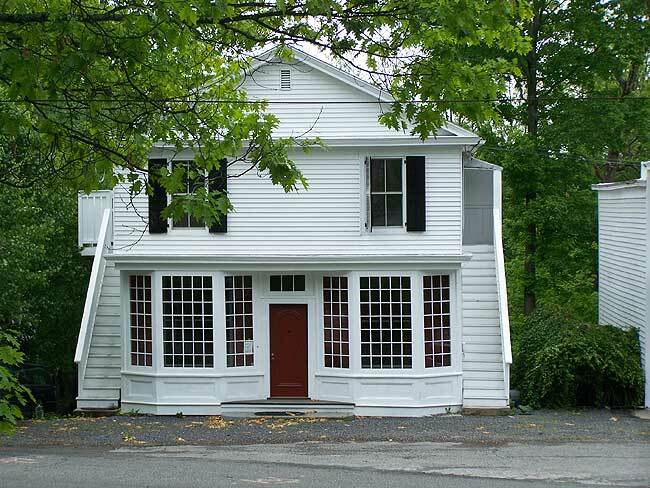 The Gager House at 96 Upper Main Street, built in 1788, has been primarily used as a residence, but it also housed Mrs. Wylie’s Old Homestead Tea Room. 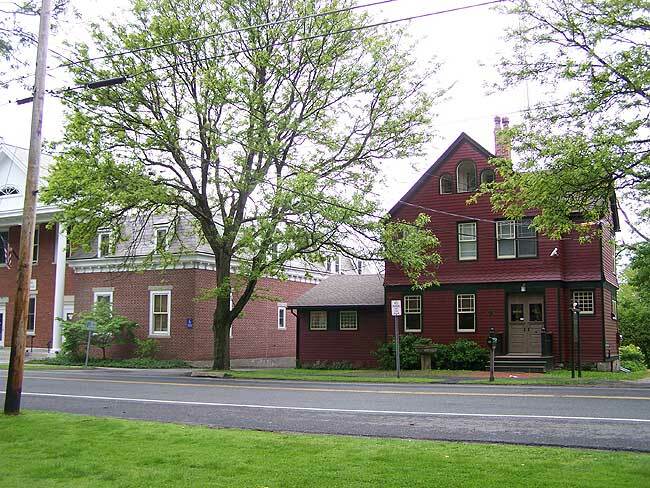 The two buildings near the north end of Green at 147 Main Street and 1 Cemetery Hill, usually referred to as the Gillette Buildings, were the preeminent commercial buildings in Sharon throughout the 19th and 20th centuries. Located in a prominent location just as the road from Lakeville enters the main part of the Green, these buildings have been the home of many businesses. 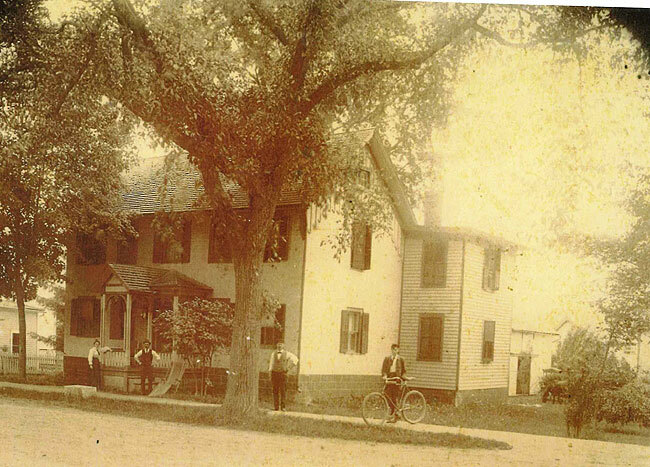 The larger building was moved to its current location from Sharon Valley or Cemetery Hill sometime before 1853. Columns were added in 1890. In the late 1800s it housed the E.F. Gillette General Store, with a sideline in furniture, and also Builders Hardware Iron & Steel. 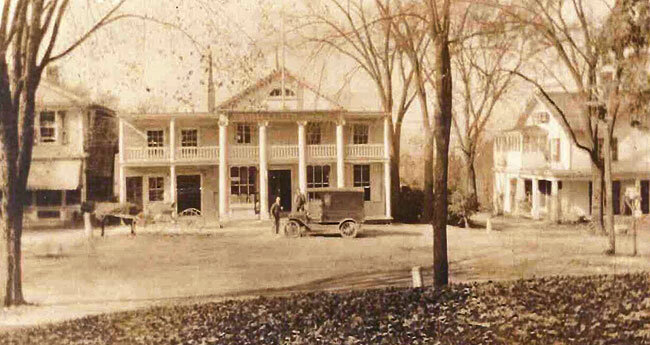 It also housed the post office at one time in the 1800s. 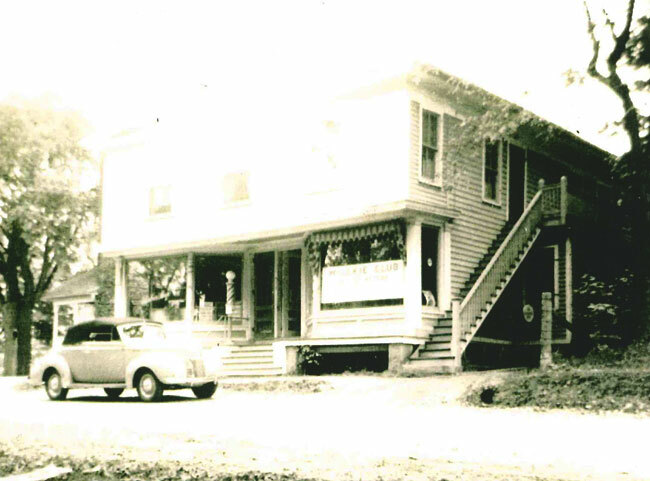 In the early 1900s it housed George Klebe’s stores and then from 1927-1963 was the home of Al Jenkins’ store, which sold groceries and dry goods. Al’s wife, Bea, was the daughter of George Klebe, the former owner. It later housed the Bargain Box and an antiques store. 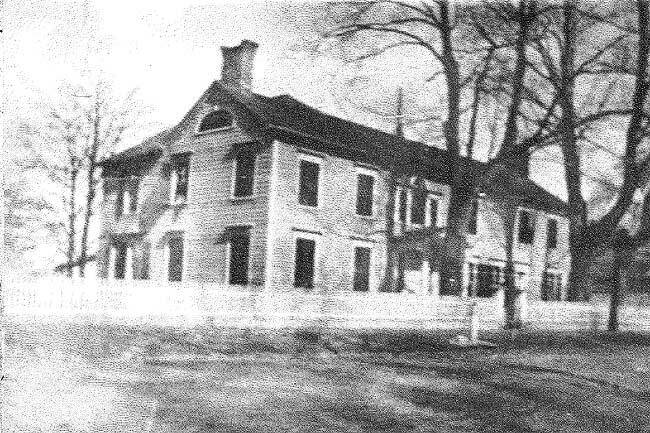 The smaller building was built between 1806 and 1837. It was first used as a hat factory. It later housed a series of pharmacies, including Cole’s, Meredith Gillette’s and Walsh’s. It later was the home of Habitant Kitchen Wares. Current views: Note that part of left wing of the larger building has been removed. The physical boundaries of the Green were laid out when the town was established in 1739 and have remained unchanged since then. Even though the Green extends almost one mile south of the clocktower, most people think of the Green as encompassing just the rectangular space running from the clocktower to the place where Main Street merges with Upper Main Street by the Methodist Church. The outer edges of the Green have included sidewalks from the earliest pictures. The sidewalks were first paved in 1912, well before the roads themselves were paved. The roads were paved in the 1930s as part of the “Let’s get Connecticut out of the mud” campaign of Gov. Wilbur Cross and in response to the efforts of the State Grange to improve the ability of farmers to get their produce to market. 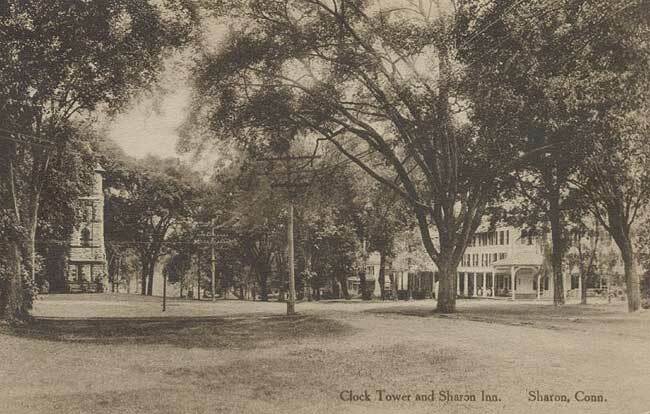 Photographs from the early 20th century show that the sidewalks along the Green stretched well south of the clocktower, providing a place for local residents and visitors to stroll. Although still visible in the contour of the land in some places, the sidewalks south of the clocktower were allowed to deteriorate and were abandoned by the 1950s. Although we have located no pictures from before the 1870s, it is likely that the Green was initially used as a common area for town residents to graze their cattle and for other civic purposes. 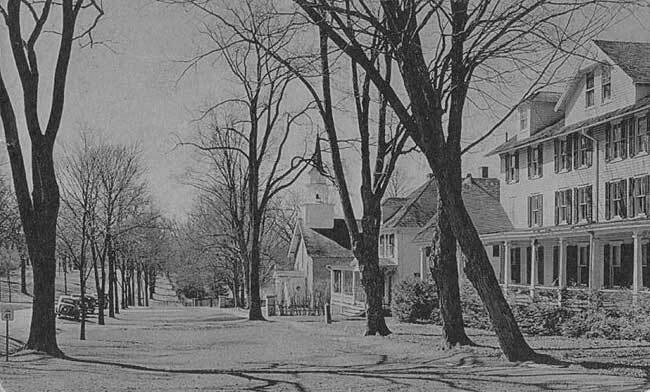 In the 1860s, the rectangular part of the Green was planted with four rows of elm trees that stretched along both sides of Main Street and Upper Main Street. 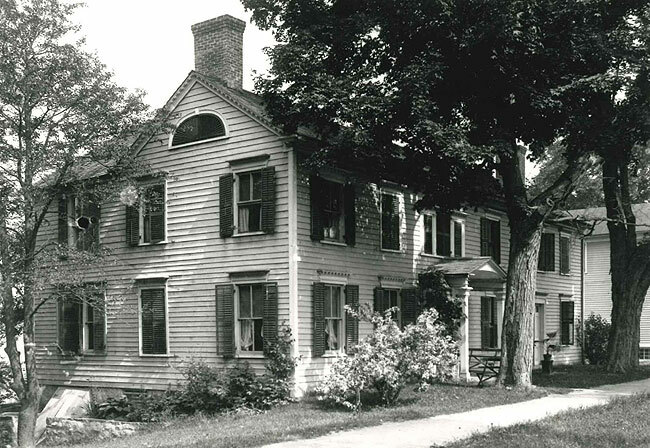 During the mid- to late 19th century, many villages in New England undertook village improvement projects. 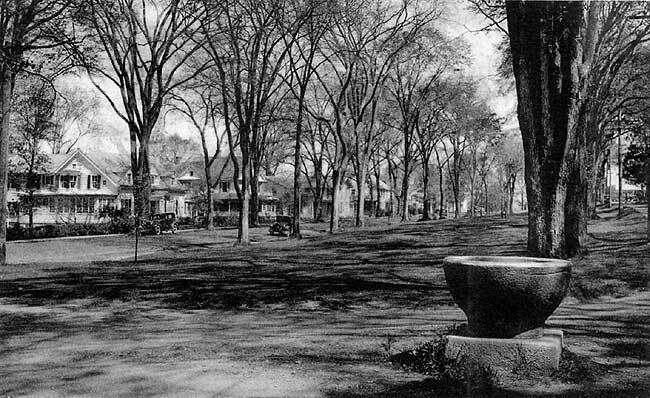 These were often associated with Arbor Days, when organized community-wide efforts were made to plant new trees to provide shade and beauty. 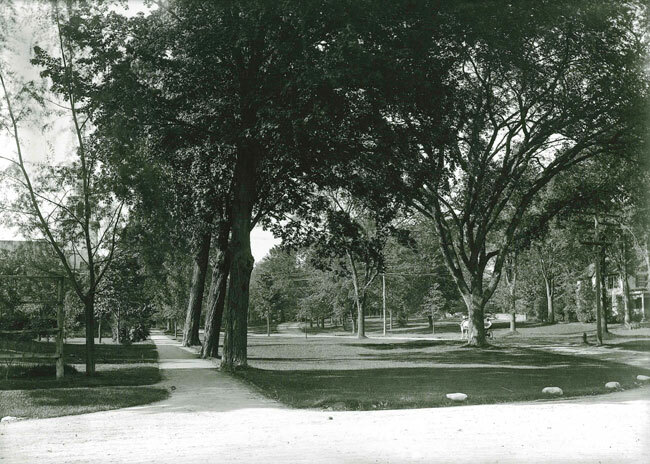 As the elm trees grew in the late 19th century, the Green was transformed from a somewhat unkempt and empty space into a beautiful, shaded park, with the roads on each side of the Green covered by a canopy of magnificent elm trees. 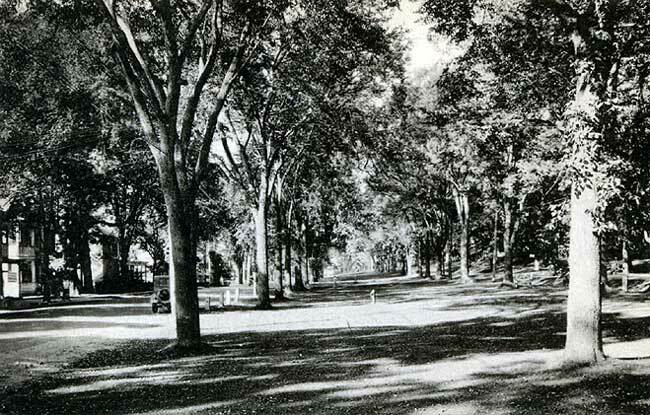 These four rows of elm trees left a wide, open space down the center of the Green that remains mostly intact today. 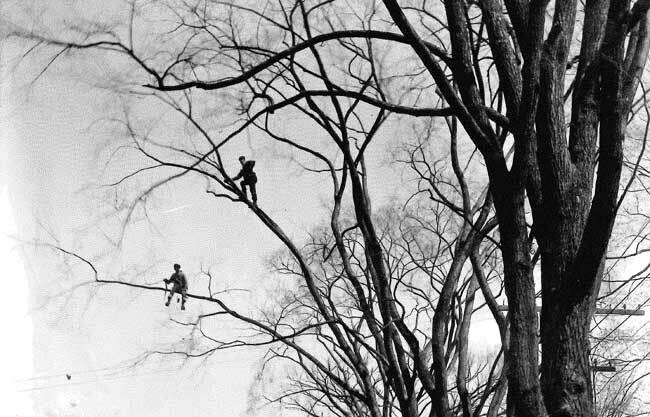 Unfortunately, most of the elm trees fell victim to the Dutch Elm disease, which began to spread through New England in the 1930s. 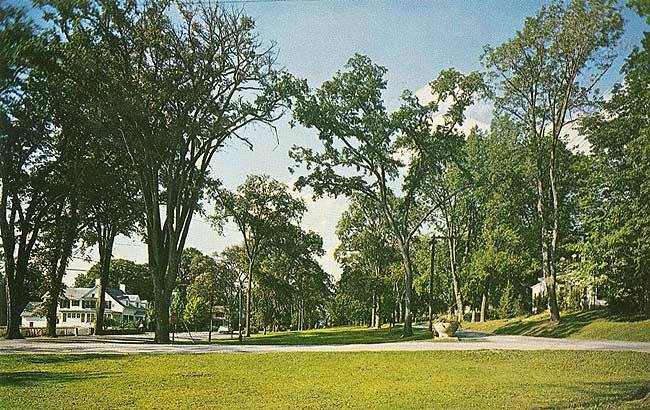 By the early 1960s, most of the elm trees on the Green had died and had been removed. 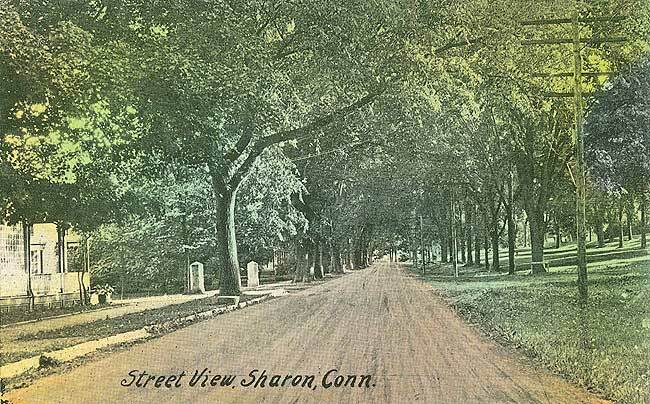 The Sharon Association, under the direction of Alice and Ted Mix and Jane Buckley Smith, led the effort to plant new trees in the 1960s. Since 1995, the Sharon Green Preservation Association has led that effort. In an effort to avoid a repeat of the plight of the elm trees, when all of the trees died of a common disease at the same time, the more recent plantings on the Green have included different types of trees. Although initially a shared space for the grazing of cattle, the Green has been used primarily as a space for public gatherings and as a public park since it was beautified in the 1860s. 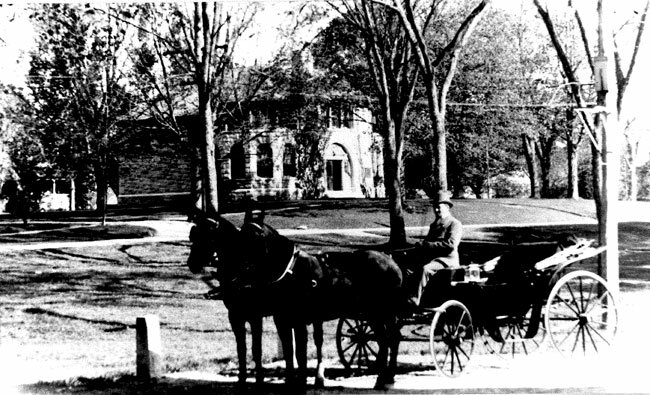 Many Sharon residents recall playing ball on the Green in the 1950s and 1960s, but that activity was discouraged by the postmaster (when the post office was still located on the Green). 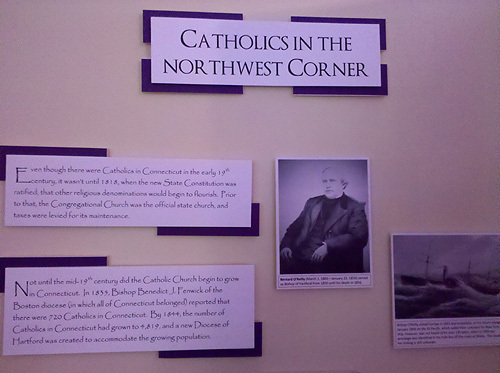 Curated by the St. Bridget History Project & Funded by a grant from the Connecticut Humanities Council. 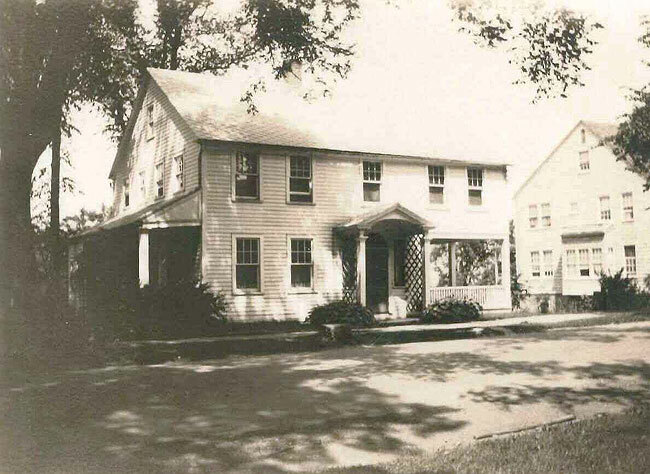 The St. Bridget History Project was awarded a Planning Grant from the Connecticut Humanities Council in the fall of 2006 to begin an oral and archival research project on the history of the parish. Local scholar Dr. Jeremy Brecher served as consultant and an on-going parish oral history project was launched. 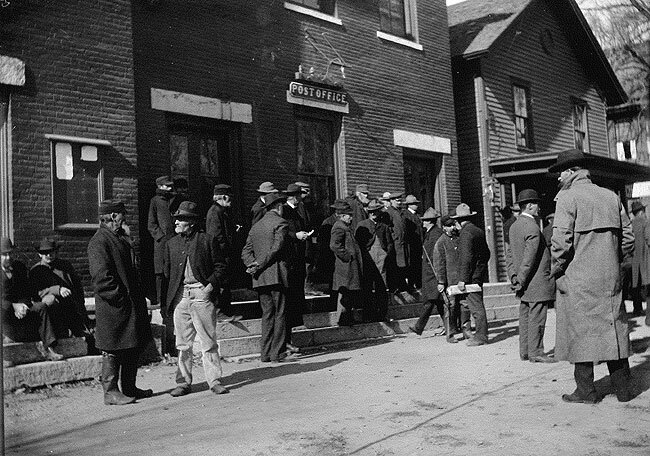 Parishioners were trained and interview subjects included parishioners, priests, and community members. The project was strengthened by a Historic Preservation Technical Assistance grant from the Connecticut Trust for Historic Preservation, awarded in 2007, for architectural consulting on the parish’s 1883 carpenter Gothic church, and a subsequent Housatonic Heritage Partnership Grant, awarded in 2008, for research on the area’s 19th century iron and other workers, including many who were founders of St. Bridget Church. 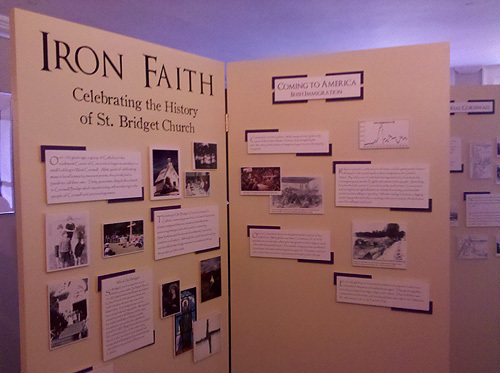 This effort culminated in the Iron Faith exhibit, made possible with a 2009 Implementation Grant from the Connecticut Humanities Council.